It has taken researchers at the Instituto de Astrofísica de Canarias almost three years to produce the deepest image of the universe ever taken from space, by recovering a large quantity of "lost" light around the largest galaxies in the Hubble Ultra-Deep Field survey. To produce the deepest image of the universe, a group of researchers from the Instituto de Astrofísica de Canarias (IAC) led by Alejandro S. Borlaff used original images from the Hubble Space Telescope (HST) taken over a region in the sky called the Hubble Ultra-Deep Field (HUDF). After improving the process of combining several images, the group was able to recover a large quantity of light from the outer zones of the largest galaxies in the HUDF. Recovering this light emitted by the stars in these outer zones was equivalent to recovering the light from a complete galaxy ("smeared out" over the whole field) and this missing light shows that some galaxies have diameters almost twice as large as previously measured. 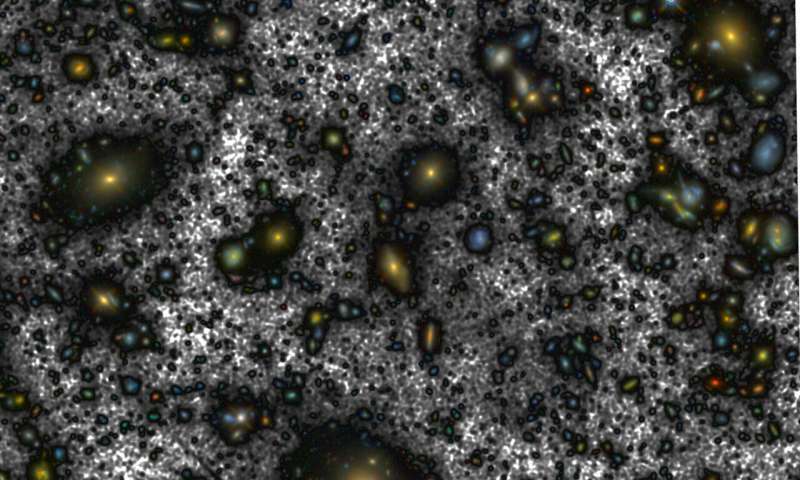 The HUDF is the result of combining hundreds of images taken with the Wide Field Camera 3 (WFC3) of the HST during over 230 hours of observation which, in 2012, yielded the deepest image of the universe taken until then. But the method of combining the individual images was not ideally suited to detect faint extended objects. Borlaff says, "What we have done is to go back to the archive of the original images taken by the HST, and improve the process of combination, aiming at the best image quality not only for the more distant smaller galaxies, but also for the extended regions of the largest galaxies. The WFC3 was installed by astronauts in May 2009, when the Hubble had already been in space for 19 years. This presented a major challenge for the researchers because the complete instrument (telescope and camera) could not be tested on the ground, which made calibration more difficult. To overcome the problems, they analysed several thousand images of regions across the sky with the aim of improving the calibration of the telescope on orbit. "The deepest image of the universe has been possible thanks to a striking improvement in the techniques of image processing which has been achieved in recent years, a field in which the group working in the IAC is at the forefront," says Borlaff. So they found more luminous matter. What does doubling the diameter do to rotation curves? Is everybody still going to say their side has always been completely correct? Stay tuned. Nah, don't bother. You already know. and this missing light shows that some galaxies have diameters almost twice as large as previously measured. The trend is not good news for merger maniacs. Are not these early galaxies supposed to be small? As I have predicted before, it is simply an observational problem, where the galactic central regions are all that can be observed at these distances, leading to wrong conclusions by fanciful merger maniacs. So they found more luminous matter. What does doubling the diameter do to rotation curves? Is everybody still going to say their side has always been completely correct? This latest instance, of vast amounts/distributions of ordinary 'previously faint' dark matter findings, when added to all the rest I have been long pointing out for @RNP, IMP-9 etc (with even more to be found by even better/newer scopes/methods), makes the 'exotic' dark matter hypotheses/searches unnecessary. I wonder how the 'exotic' DM 'enthusiasts' will spin this latest finding for ORDINARY faint/dark matter, which is now an inescapably obvious trend from recent mainstream discovery/reviews. I have been long pointing out for @RNP, IMP-9 etc (with even more to be found by even better/newer scopes/methods), makes the 'exotic' dark matter hypotheses/searches unnecessary. As usual, the monomaniacal RealityCheck leaps to the wrong interpretation of the article. If there is more luminous matter than expected in the outskirts of galaxies, then there is also more dark matter. Besides, it does not alter the need for DM in the inner regions. Learn the physics behind articles you read before commenting RealityCheck!!! @RealityCheck, glad I could help improve someone's day! RealityCheck leaps to the wrong interpretation of the article. If there is more luminous matter than expected in the outskirts of galaxies, then there is also more dark matter. Besides, it does not alter the need for DM in the inner regions. Oh @RC, you math&physics ignoramus. If the extra outlying areas have only just now been glimpsed using extreme digital processing, then it's safe to assume they weren't seen before. Right? And since they hadn't been seen before, it's because the amount of light coming from these outer regions of these galaxies is pretty low. Right? And if the amount of light coming from these regions is pretty low, then the numbers of stars in these regions must be very low. Right? And since these regions had also not been visible in radio/microwave/IR, then the amount of material not contained in stars - dust, gas, etc., must also be pretty low. Right? So, even if the "extents" of these galaxies are now double their previously estimated diameters, the masses of extra material is WAY smaller than your "FOUR times" the original. Fun question: if I have two solid spheres of steel, 1 cm and 2 cm in diameter, how much heavier is the second compared to the first? 1. They weren't 'seen' before only because data imaging/analysis previously was not sufficiently able to discern below 'cut-off' brightness/intensity parameters/capabilities etc applied then, that's all. It doesn't mean the dust/stars etc content/light in those regions was that much less; just below 'cut-off' levels applied then. 3. The nature/age of the stars, and the dustiness/plasma light absorption/extinction etc is not known 'there' (and along transit path to 'here'), so your assumptions/rationalisations are mere speculations and not factually based. 5. As pointed out, your assumptions/conclusions/speculations/rationalisations are not factually based, so your assertion is irrelevant. Anyway even just THREE times is a LOT MORE than previous (under)estimates. The "ICM" in the last line of my post to @SkyLight should have been "Intergalactic Medium" (ie, the 'ordinary' matter throughout the deep space between the galaxies WITHIN a cluster of galaxies...or "INTRA-Cluster Medium" if you prefer), consistent with original post to @RNP. Thanks. @RC, surface brightness of a galaxy is determined by the number of stars or the amount of dust and gas. So, if the surface brightness is low there aren't many stars or much dust and gas. @SkyLight merely assumed anyone with a brain would be able to figure this out. Heh, the uber-obtuse @RC does some hand-waving and throws out the baby! You have no idea what you're talking about, you have no formal training in science, no understanding of math, but you DO have a massively over-inflated ego, a LOUD MOUTH, you have not the slightest ability to learn science the hard way, nor to grow as a person. @105LiarRC uses excuses just like @Benni. If you're just gonna make up more lies you're just gonna look stupider. Just forget it. It ain't gonna work. When yuo start trolling, I troll yuo back. Surprised yuo haven't figured that out before. Yuo must not be very bright. You just lied, DS. I explained about the dustier universe; and about the near edge limitations re what is observed of low-surface-brightness features at distance. And you just started to insult and troll in lieu of proper reply. How can you think no-one else has noticed that fact, DS? Are you that lost to self-awareness of what you are actually doing/saying? Not good, DS. They're dimmer at the outer edges. Yuo claim they're as dense or denser where they're dimmer. Now, who's lying again? Just askin'. Pretty quick I start posting 105LiarRC lie posts again. Yuo got the high road and the low road. Yuor choice. Oh, and now it's @106LiarRC. Yuo just got caught again. And this one is a stupid lie. Just like @Benni, yuo always got an excuse, and it's always a lie. And a stupid one. Yuo gonna start telling us about half-life next? What "excuse", DS? I point out known/evolving mainstream discovery/review based facts and understandings replacing old/naive assumptions/interpretations which you and SkyLight have been labouring under while insulting and trolling me while blithely ignoring/denying the fuller implications which I am pointing out as to why 'exotic' DM is no longer 'needed' because 'ordinary' previously dark matter is being found sufficient to explain the cluster lensing effects. And that you resorted to associating me with @Benni tells the intelligent reader you are desperate to distract/demean instead of argue fairly based on what is being presented to you. Not good, DS. I'll be frank, @106LiarRC. I find yuo boring. Like most trolls. Yuo lie about discoveries to support yuor claims, which mostly look like intentional trolling attacks against science. Yuor claims have been invalidated. Telling yuo so is not trolling, it's just telling the truth. Yuo've made up a fairy tale about bright matter being dark matter, and it doesn't matter how many times yuo tell it, anyone who knows any science knows yuo're lying. I'll be frank, @106LiarRC. I find you boring. Like most trolls. Now if you could be objective scientist and honest discourser rather than a frank troll, you might learn something instead of being a frankly insulting troll of the first water who has not learned from all his many past faux pas while being ignorant of what is actually correct according to the known evolving science I have been pointing out for your benefit to apparently little avail due to your ego trolling instead of respecting your intellect and science. Too bad, DS. It's PREVIOUSLY DARK but NOW FOUND matter, you lying strawmanning twit, DS. How can you function with such twisted non-reading/misreading mentality, DS? Not good. I am honest. I am telling yuo the truth. Yuo just don't want to believe it. I can't help that. I am not a psychologist or psychatrist. Yuo will need one of them to help yuo. If yuo get a good one they'll go look it all up and ask yuo why yuo don't believe ten thousand astrophysicists. I am honest. I am telling yuo the truth. Yuo just don't want to believe it. I can't help that. I am not a psychologist or psychatrist. Yuo will need one of them to help yuo. You need one, DS. Because you wouldn't know the truth until it was drummed into you after pages of your insulting behaviour. Recall that 'plasma in the sun' discussion?...wherein you were shown to be a lying insulting twit of the first order who finally had to admit you were wrong despite insulting me for days with your DIShonest lying nonsense and accusations just like now. Stop being a frank ego-twit troll, DS; and just listen and learn for a change. Try. The relevant phrase in previous post should have been: ...'plasmoids in the sun' discussion?... and not ...'plasma in the sun' discussion? Thanks. @106LiarRC, I don't need a psychologist to tell me anything. I can look it up and tell yuo're lying. Typical denial and projection, DS. Not a good sign, DS. An even worse sign is that you are intending to again list your wilfully misconstrued examples which will only go to prove to the intelligent reader just how haplessly ego-twisted and dishonest unheeding and unteachable ego-twit troll you have been for years already...so no change there then, DS. Not good, DS. Typical denial and projection, DS. Not a good sign, DS. An even worse sign is that you are intending to again list your wilfully misconstrued examples which will only go to prove to the intelligent reader just how haplessly ego-twisted and dishonest unheeding and unteachable ego-twit troll you have been for years already...so no change there then, DS. You really do never learn, DS. Not good, DS. @106LiarRC, they are yuor words. Do yuo deny them? Cool by me, @106LiarRC. They'll sure know yuo lie all the time. Note this last thread recapitulates an ongoing claim by @106LiarRC that "four defects" were found in the BICEP2 paper on inflation and @106LiarRC has never said what three of them are. They'll sure know you falsely accuse me of lying etc; while all the time it was you lying/wrong all along, DS. Good for me, DS. But not good for you, DS. ps: DS, where is the link to the 'plasmoids in the sun' discussion?...wherein you falsely accused me etc while you were wrong all along and had to finally admit it. Be honest and include that link too, DS. Are you a cowardly as well as dishonest troll, DS? Dudebro, I can keep this up all night. Do yuo really need to see it all again? Go for it, mate! You're doing me a great service by directing new readers to posts previously hidden by the downvoting campaigns of bot-voting gangs who couldn't stand being wrong while I was confirmed correct all along by mainstream recent discoveries/reviews. It's all good for me and for science discourse that new readers will now see my posts and see for themselves how unconscionably stupid and malicious some trolls (you included, DS) have been while being insulting and wrongheaded while attacking me for being correct. pps: there's a link in your list where you mis-attribute @Benni's comments to me re Rubin etc. You were made aware of that/other errors a few times before now. Don't you read, DS? Like I said, @106LiarRC, there's no point in lying any more. Yuo've been caught too many times. Plenty more where this came from. ...there's no point in lying any more. Yuo've been caught too many times. Plenty more where this came from. That could very well be the truest thing you have ever (unwittingly) said about yourself, DS. When intelligent objective readers read those links you listed they will see that your words apply to you not me! All 'own goals' by you, DS! All noted you strawman, misconstrue, misattribute etc as your juvenile go-to trolling tactics; which failed you miserably for years now, DS. You apparently never learn, DS. Not good, DS. Wasn't it claiming the Big Bang is a religion somewhere on here? Looks like it's the real religionist. How in the name of objective science and atheism did you come up with the obviously insane misconstruing that an ATHEIST (me) could be a "Young Earth Creationist", DS? Are you gone totally bananas, DS? Even your wretchedly malignant bot-voting troll-buddies @Captain Stumpy and @Uncle Ira aren't so bananas to come to such a bizarrely self-contradictory misreading of the acts as that, DS. ps: Speaking of malignant bot-voting nincompoops, there goes @Captain Stumpy right on cue, being an irrelevant twit of a noisy troll as ever. He must have "reported" me a at least a thousand times over the years, but the admin have ignored him for the vexatious lying internet loser troll that he has proven himself to be for years now. Poor Stumpy. It looks like he'll die as insensibly stupid as when he was born, only more malignant, noisy and irrelevant. Sad. In order to say something is a lie, don't you have to start with a known truth? Since all these theories are theories, the most you can say is "I think it's unreasonable to disagree with the standard theory based on the information at hand" or "I find your interpretation of the information at hand to be unconvincing." Going straight to "lying and mentally disordered" is excessive and unsupported. Ah, but everyone knew that already. Hey guys, go see what mainstream slowly discovering re vast amounts of ordinary matter ejection rates into deep space from galaxies! Maybe that latest mainstream report, in long line of mainstream discovery/reviews (effectively indicating 'dark matter' is 'ordinary'), will stop some of the trolls from attacking me just because 'I got there first' with the updated understandings of what mainstream is discovering/reviewing re these/other aspects of previous naive/simplistic assumptions/interpretations of actual astro/cosmo phenomena/data. It is past time the 'exotic'-DM hypothesis was RE-LABLED to reflect Zwicky's ORIGINAL 'ordinary'-DM hypothesis. Going straight to "lying and mentally disordered" is excessive and unsupported. How about after 12 or 11 years, is that long enough for a "lying and mental disorder"? If that is not enough time, how long you should wait before you can tell the Really-Skippy he has a mental condition? Choot, even Professor-Steinhardt said he was demented after reading just two paragraphs of the Earthman Playhouse stuffs the Really-Skippy wrote. @RC, I wasn't disagreeing with you on the trends in the data, I was objecting to all this ad hominem noise.